Enzymes are sensitive and work best under specific conditions. Enzyme activity is affected by several things and each type of enzyme has its own specific optimum conditions under which it works best. Enzymes work best when there is a high enough substrate concentration for the reaction they catalyse. 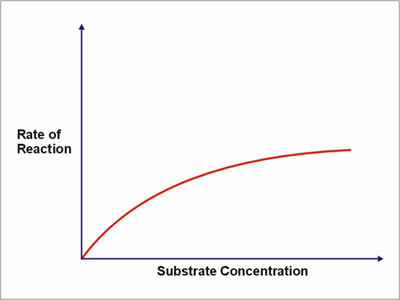 If too little substrate is available the rate of the reaction is slowed and cannot increase any further. Sometimes, if there is too much product accumulating, the reaction can also be slowed down. Therefore it is important that the product is removed regularly. Enzymes are affected a great deal by temperature. If the temperature is too cold the enzymes move around too slowly to meet the substrate and for a reaction to occur. As the temperature increases though, so does the rate of reaction. This is because heat energy causes more collisions between the enzyme and the substrate. However as you will remember all enzymes are proteins and at too high temperatures the proteins break down. 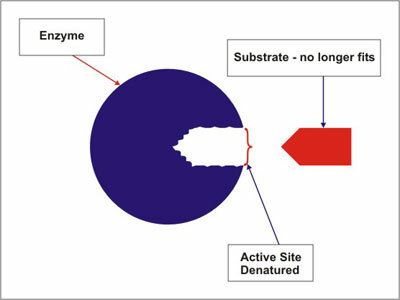 The active site of the enzyme becomes distorted and so the substrate no longer fits and hence the reaction does not occur. We say that the enzyme has been denatured. The pH must be correct for each enzyme to work at its best. Different enzymes work best at different pH values. 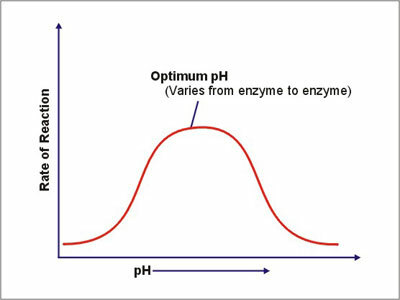 The optimum pH for an enzyme depends on its site of action. For example, enzymes in the stomach have an optimum pH of about 2 because the stomach is acidic, but intestinal enzymes have an optimum pH of about 7.5. If conditions are too alkaline or acidic for that particular enzyme then its activity is affected. This occurs because the enzyme’s shape, especially the active site, is changed so can no longer bind to the substrate molecule. We say that the enzyme is denatured.